Saliva drainage—Saliva may leak through the incision after it has been closed. Fistula formation—This is an abnormal connection between 2 structures. Talk to your doctor about any medicine, herbs, or supplements you are taking. Some may need to be stopped up to one week before the procedure. Arrange a ride to and from the hospital. General anesthesia may be used. This will keep you asleep. Local anesthesia may be used for smaller procedures. The area will be numbed but you will be awake. A cut will be made under the ear and down to the throat. Nerves in the area will be carefully moved aside. Damaged tissue will then be removed. A cut will be made in the neck below the jawline. The gland will be removed. If needed other objects like lymph nodes or stone will also be removed. A cut will be made through the mouth. If a large amount of tissue needs to be removed a cut will be made in the neck. Once tissue is removed the area will be closed with stitches. A drain may be placed to let fluids leave the wound. Time will depend on the type of surgery. Simple surgeries may take less than an hour. Complex ones can take up to 5 hours. Anesthesia will prevent pain during surgery. There will be pain in the area after surgery. Medicine can help to manage the pain. Salivary gland surgery. Cedars-Sinai website. Available at: http://www.cedars-sinai.edu/Patients/Programs-and-Services/Head-and-Neck-Cancer-Center/Treatment/Salivary-Gland-Surgery.aspx. Accessed December 28, 2018. 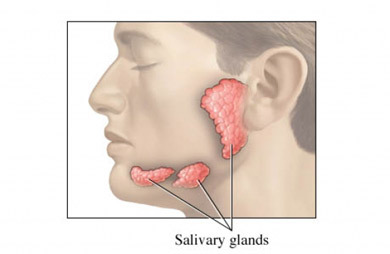 Salivary glands. American Academy of Otolaryngology—Head and Neck Surgery website. Available at: http://www.entnet.org/content/salivary-glands. Accessed December 28, 2018.